This locally renowned 4-day event is an exclusive opportunity to see behind-the-scenes of the artist’s studios and buy affordable contemporary art, crafts and gifts directly from over 150 of the most talented artists and makers in London. Here’s a quick guide to everything you need to know to ensure a great visit to Wimbledon Art Fair. When is the Art Fair open? Can I come to the Official Launch Night? Yes, you can. We're delighted to announce that BBC Arts Correspondent, Gallerist and Industry Expert, Maeve Doyle, will be here to officially open our 44th show on Thursday 15 November from 6.30pm - 10pm. There will be complimentary bar and live music from The Spenders too. We do have limited spaces available, so please make sure you RSVP here by 13 November to avoid disappointment. Head to Wimbledon Art Fair on Friday 16 November for our Late View Night. From 6pm-10pm, enjoy complimentary drinks, whilst listening to a live performance from Heidi Petite and viewing affordable contemporary art. Which artists will be exhibiting at the Art Fair? We have 150 of London's most exciting contemporary artists, exhibiting in the May 2018 Wimbledon Art Fair. Plan your visit and discover the artists here. By car: We have limited parking available, please use public transport where possible. By bus: The 44/77/270 run along Garrett Lane, between Tooting Broadway and Earlsfield Stations. The 493 can be taken from Wimbledon Railway Station, along Plough Lane. Alight at the Wimbledon Stadium Stop. Will there be anything for the children to do? Yes, plenty! Our sponsors Jackson-Stops will have kids’ activities on Saturday and Sunday, plus our artists are holding a variety of workshops and demonstrations for the whole family. Are there any other activities? From pottery demonstrations to Abstract Art talks, there's plenty to see and do. How long should I spend at Wimbledon Art Fair? As long as you wish! We recommend that it takes 4 hours to explore the whole of the Art Fair (don't worry, that includes a tea break too!). Don't have much time? Take a look at the exhibiting artists, circle your favourites and visit them. A member of staff can point you in the right direction, if you need a hand. Is there food and drink available at the Art Fair? Yes, we have Home Community Cafe providing culinary delights over the weekend and Cafe 2 U providing a selection of hot drinks. You can also enjoy a glass of Prosecco, beer from By The Horns Brewery or seasonal mulled wine too. I'm in a wheelchair, will I be able to see the studios? Yes, of course. There is wheelchair-friendly access to 7 out of the 8 floors, so there's plenty to see. Accessible toilets and blue badge parking bays will also be available. Can I pay by card at the Art Fair? Yes, we can accept all major cards in the payment office and at the bar. How can I support the Art Fair? As a not-for-profit organisation, we are very grateful for any support we receive. There will be a number of donation stations across the 8 floors. Recommended donation is £4, which will go a long way to helping fund the show and supporting our artists. When is the next Art Fair? The next Wimbledon Art Fair is the 9 - 12 May 2019. Follow us on Facebook, Twitter and Instagram to keep up to date with all our news until then. Perla Mignanelli is an Italian painter, who recently joined Wimbledon Art Studios. Inspired by gothic art, women and her surroundings, we’re keen to find out more about Perla and her practice. Hi Perla, so what do you enjoy about being an artist here at Wimbledon Art Studios? The creative environment - there are so many various and talented artists sharing knowledge and skills, spending time together and help each other out. You’re surrounded by people who believe in what they do. Tell us about your work, what are you known for? I mainly do painting and mixed media on canvas, mostly portraits. What should we expect to see at the upcoming Wimbledon Art Fair? Inspired by Frida Kahlo and Mexican Art, my latest collection of paintings is part of what I call decorative art. I’m experimenting with displaying canvases layered on top of each other at different angles. I have an exhibition at The Brick Lane Gallery from the 9 - 21 October 2018. Thanks Perla, we look forward to visiting you in studio 282 at Wimbledon Art Fair, from the 15 - 18 November 2018. Wimbledon Art Fair returns from 15-18 November 2018 to showcase the work of over 150 of London's most exciting artists and makers. We are looking for an enthusiastic group of volunteers to help run the amazing Wimbledon Art Fair. This is a fantastic opportunity to work within the creative industries and be part of a team hosting an event that attracts around 8,000 visitors annually. Maintaining a welcoming and friendly atmosphere throughout the show. Dealing with any queries or questions about Wimbledon Art Fair. Helping visitors to navigate the studios, directing them to the artist they are looking for. Providing information about Wimbledon Art Fair and the artists taking part in the show. Maximising opportunities for visitors to donate and purchase affordable artwork. Wimbledon Art Fair is self-funded and we rely on the generosity of our visitors to keep it going. Try something new and gain additional skills in event management and organisation with Wimbledon Art Studios. If you're interested in this volunteer role then please send your CV to enquiries@wimbledonartstudios.co.uk and we will send successful candidates a registration form to fill in with their available times. Food will be provided throughout and we are happy to provide references. Yes, you can. We're delighted that Kate Bryan, Sky Arts judge and Soho House Head of Collections, will be here to officially open Wimbledon Art Fair on Thursday 10 May from 6.30pm - 10pm. There will be complimentary bar and live music too. We do have limited spaces available, so please make sure you RSVP here by 5.5.18 to avoid disappointment. There certainly is! Award-winning sugar artist Jacqui Kelly will be teaching Chocolate Honey Bear workshops on Sunday, plus there's a decoupage station, face painting, screen printing & more. Yes, we have Little Reds Pizza and Mood Food Cafe providing culinary delights over the weekend and Cafe 2 U providing a selection of hot drinks. You can also enjoy a glass of Prosecco, beer or seasonal Pimms too. Making a day of it? Pop into Ben's Canteen for a delicious brunch or hearty burger before or after the show. The next Wimbledon Art Fair is the 15 - 18 November 2018. Follow us on Facebook, Twitter and Instagram to keep up to date with all our news until then. The newly named Wimbledon Art Fair launches in a weeks time and this November, it's going to be bigger and better than ever. Over 150 artists open their studio doors for four days, welcoming you to browse, discover and buy directly from them. Immerse yourself in our creative community and explore a collection of unique artworks and gifts. Keith Brymer Jones, ceramicist and judge on BB2's The Great Pottery Throw Down, is here to launch the 25th Wimbledon Art Fair. Plus there's a free bar and live music... one not to be missed! RSVP here by 12.11.17. Join us as we auction a unique collection of original contemporary artworks, donated by our established and emerging artists. The money raised from this auction will help the Arts Team at St George's University Hospitals NHS Foundation Trust to continue to expand their art collection, as well as supporting their innovative arts programmes that enhances the well-being of the 3.5 million patients who visit the Trust each year. There certainly is! Art-K will be in studio 221, with lots of activities for the kids. Plus there will be workshops with Jacqui Kelly of Totally Sugar, screen printing with Jane Bain and many more. Pick up your activities programme from the reception desk when you arrive. Yes, we have Mood Food Cafe providing culinary delights over the weekend and Cafe 2 U providing a selection of hot drinks. You can also enjoy a glass of Prosecco, beer or festive mulled wine at the bar. The next Wimbledon Art Fair is the 10 - 13 May 2018. Follow us on Facebook, Twitter and Instagram to keep up to date with all our news until then. We're delighted that Jilly Vainer, of studio 514, has been shortlisted for Wildlife Artist of the Year 2017. The exhibition will take place at the Mall Galleries from 27th June - 1st July. We caught up with Jilly in the lead up to the Open Studios in May. I am an upcoming artist specialising in wildlife/animal Sculptures, well known for my Dog/Horse portrait's and sculptures of endangered species. The private members club “Leander” at Henley Regatta, has a permanent fixture of one of my Hippopotamus sculptures, as this is their mascot for the club. Anything we should look forward to for the May Open Studios? My latest collection captures the movement of migrating swallows, these are wall installations for indoors and outdoors and at the moment I am also working on a Spatuletail Humming bird. What's your career highlight so far? I was very happy to have one of my sculptures chosen by the “society of wildlife”, my hibernating Dormouse was exhibited at the “mallgalleries” in London SW1. 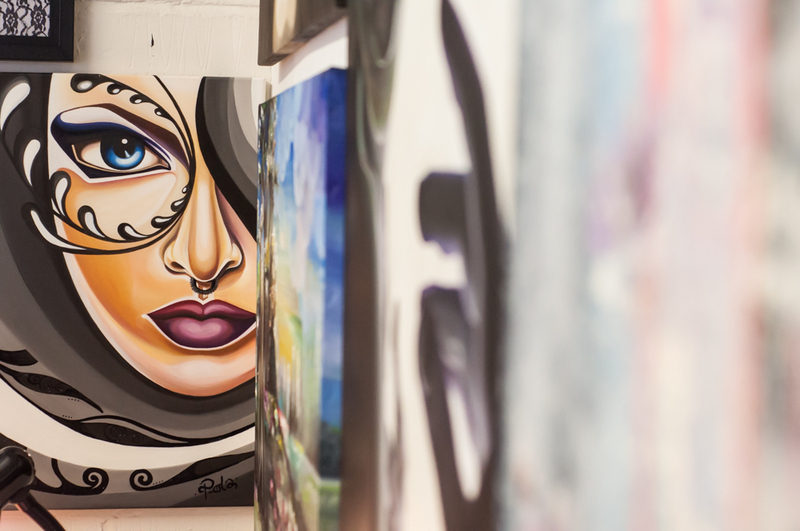 How has Wimbledon Art Studios helped your career? WAS has offered me over the last 9 years a great platform and opportunity to show my work to the public at their twice-yearly exhibitions. Slowly this has turned a lifetime hobby in to a more commercial venture. The studios also offer a great sense of community and support this is very welcoming when you are starting any new venture. How would you describe yourself and your work? I consider myself an upcoming old guy. My art has been a very slow expression of crazy ideas which I dreamed about 20 years ago. Over time they have become more structured, more refined and more real. Most of them feel like being trapped inside an old science fiction movie… Which is a lot like normal life these days. I try to find humour and beauty in the experience. I studied architecture rather than fine art. My paintings use architecture to make art these days. I make art using computer code, machines and paint brushes. The mixture of media lets me say something about the present. Some people feel the beauty in the pieces. Most don’t. A good deal of visitors have to walk past my door a good few times before crossing the threshold. I guess you could accuse my work of being an acquired taste. Difficult to digest. What can we look forward to at the show? Anything new for 2017? In previous shows I have displayed a lot of small scale prototypes and models. Now that I’ve figured out how to actually make them, I’m going to be showing bold, large scale reliefs. I find that bigger is always better with art. Simple ideas don’t have presence until you have to stand back and look up at them. Where can we see your work at the moment? I have two pieces in the national museum of Wales digital collection. I currently have work on show at Tower 42 in the city. Gallery Nummer 40 in the Netherlands will be showing a range of “Masterplan” paintings at various UK and European art fairs through the year. Have you received any awards? None. I’m not happy about this. People tell me I should enter competitions. What do you enjoy about being at WAS? WAS is a relaxed creative space filled with hundreds of very interesting artists. It’s my happy place. Unlike other studios, WAS lets me run a studio with industrial CNC machinery and power tools. They open 24 hours, so I can work till 3am.